If anything, OnePlus will be remembered by its invitation-based orders for their "2014 flagship killer" and a slew of controversial and generally – badly thought-out competitions. 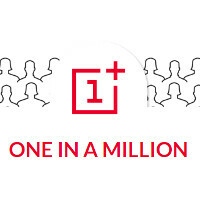 Well, we're about to tell you that there is yet another OnePlus One giveaway in tow... oh, oh. No, no cause for alarm this time, as there will be no sexist requirements, nor will the company ask you to smash your current phone to bits. It's just a random draw, which you enter by just submitting your name, email address, and liking OnePlus' Facebook page. The company claims it's to celebrate having 1,000,000 fans on Facebook and the draw (it's kind of hard to call it a "contest") goes by the moniker "One in a million". The handset they will be giving away is the 64 GB, Sandstone Black one. We know that there are some mixed feelings among our readers about the OnePlus One, but hey – a free flagship is a free flagship. Will you be entering the draw? Will there be a yellow tinted bottom free replacement display contest??? I'm beginning to think one plus is a hype company, not a tech company. So much news, so few products. They should spend all their PR money on customer service, product development, and logistics instead. I'm beginning to think they are using this gimmicks to get people's information.... It seems like it is not for mobile business purposes but for something else they want to plan and achieve in the back end. I'm out again, since I don't Facebook. I'm one one of three without a Facebook account, lol. Now... Who is that third one, my friend?? ?